Three contemporary jewellers are opening a pop-up shop in Clerkenwell for six days in mid June to showcase and sell their work. "Three remarkable London based contemporary jewellers Jenny Llewellyn, Sarah Straussberg and Karolina Paszkiewicz have decided to collaborate for The London Jewellery Week 2013 and organise a Pop Up Shop in the heart of Clerkenwell. 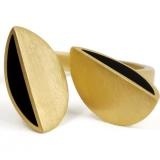 Sarah's jewellery combines sculptural forms with wearable designs, creating fashionable and easy to wear jewellery that will compliment any outfit. The work comprises of Sterling Silver with 18ct Gold vermeil. Some pieces include black resin, encased within the brushed matt surface of the Gold. Inspiration often comes from patterns in nature and then Straussberg develops forms and structures from these findings. The 'Lily' range was inspired by breaking down the original forms of the 'Ellie' range and creating the 'skeleton' of the form. Karolina’s collection utilises the natural beauty of the butterfly in a way that has never been done before. This is due to an original technique, created and developed by her, which gives eternal life to butterflies by capturing and maintaining their living beauty even after they have passed away. The result is a range of stunning individual pieces that not only incorporate the beauty and history of that particular butterfly but also her passion and excellence for the industry. (All butterflies died naturally)."